By Raymond Britt -- In the last twelve months, more than 41,000 triathletes finished 25 Ironman Triathlons. Each finisher met the daunting challenge of a 2.4 mile swim, a 112 mile bike and a 26.2 mile marathon. Of the finishers, nearly 1600 qualified to compete in the 2010 Ironman Triathlon World Championship. 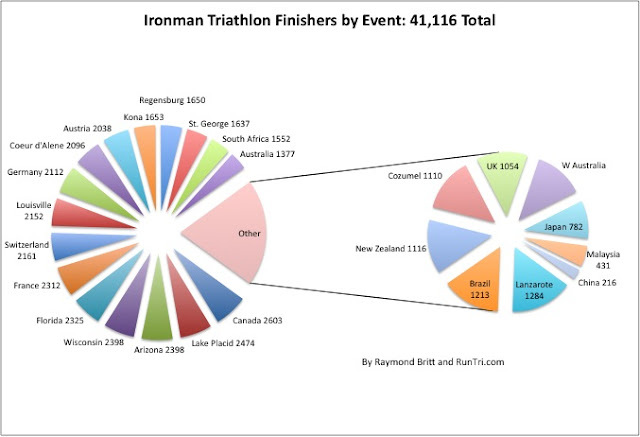 If you add non-Ironman branded Ironman distance races to the mix, such as Challenge Roth, we estimate a global total of 50,000 finishers. While there is no such thing as an easy Ironman, some were clearly more difficult than others. Our data shows between 5% and 7% DNF rates for most events. Ironman St. George and Louisville, however, posed extraordinary difficulty in 2010; each had DNF rates around 15%. See RunTri's Ranking of 25 Toughest Ironman Races for details.